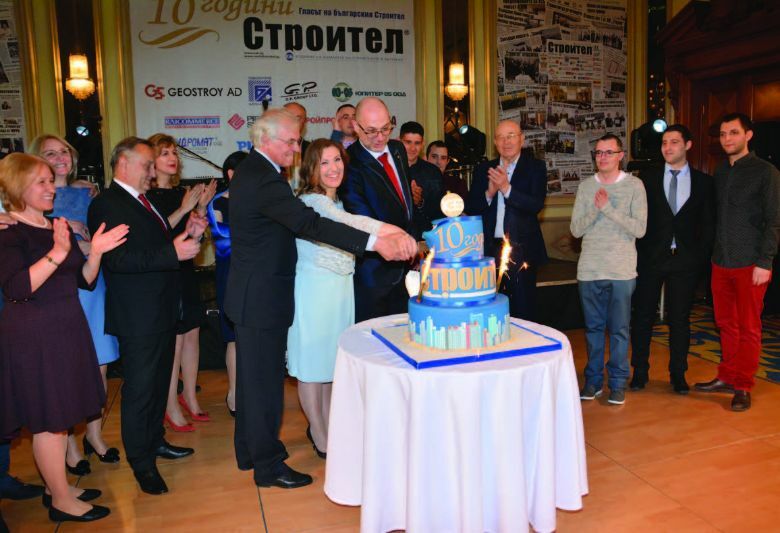 On 3rd April „Stroitel“ Newspaper – the official edition of the Bulgarian Construction Chamber, celebrated its tenth birthday with a cocktail at Sofia Hotel Balkan. 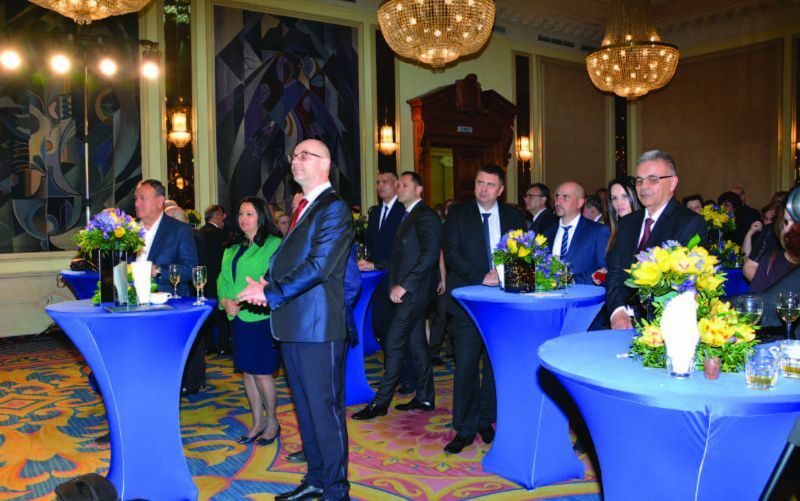 Together with the team of the newspaper, the occasion was celebrated by the Management of the Bulgarian Construction Chamber (BCC), chairpersons of the RO of BCC, partners and advertisers, representatives of the central and local authorities, of employers and of branch organisations, of trade unions and of the scientific circles. Official guests at the event on the occasion of the anniversary were the Deputy Minister of Regional Development and Public Works Eng. Valentin Yovev, the Deputy Minister of Economy Aleksander Manolev, the Deputy Minister of Agriculture, Food and Forestry Dr. Lozana Vassileva, Georgi Terziisky – Chairman of the MB of Road Infrastructure Agency (RIA). BCC was represented by the Chairman of the MB Eng. Iliyan Terziev, the Deputy Chairmen of the MB Vladimir Zhitenski, Eng. Hristo Dimitrov, who is also a Chairman of the RO of BCC – Varna, and Eng. Nikolay Nikolov – Chairman of the RO of BCC – Burgas, the Honorary Chairmen of the Chamber Eng. Simeon Peshov and Eng. Svetoslav Glosov, the Executive Director of BCC Eng. Miroslav Maznev, Assoc. Prof. Dr. Eng. Georgi Linkov, Chairman of the Committee for keeping, maintenance and use of the CPRB, Valentin Nikolov, Chairman of the Control Council (CC) of BCC, Eng. Rozeta Marinova – Member of the MB of BCC and Chairperson of the Committee on Professional Ethics, Vladimir Vutov, member of CC of BCC, members of the MB and chairpersons of RO of organization, Eng. Nikolay Stankov – ex-chairman of the MB of BCC, currently advisor to the cabinet of the Minister of Regional Development and Public works, etc. The birthday party of „Stroitel“ Newspaper was honored also by Iskren Veselinov, Chairman of the Parliamentary Committee on Regional Policy and Local Self-Government, Halil Letifov, Chairman of the Parliamentary Committee on Transport, Information Technology and Communications, Eng. Galina Vassileva – Head of the Managing Authority of Operational Programme „Transport and Transport Infrastructure 2014 – 2020“, Prof. Dr. Eng. Stoyan Bratoev – Executive Director of „Metropoliten“ EAD, Eng. Ioanis Parteniotis – Vice president of CL Podkrepa, Silvia Geogieva – Executive Director of the National Association of the municipalities in the Republic of Bulgaria, Prof. Dr. of Architecture Architect Borislav Borisov – Rector of the University of Structural Engineering and Architecture „Lyuben Karavelov”, Prof. Dr. Eng. Ivan Markov – Rector of the University of Architecture, Civil Engineering and Geodesy, and many others.